A healthy snack with only 3 ingredients! If you add protein powder it can be a good breakfast option too, for days when you’re on the go. 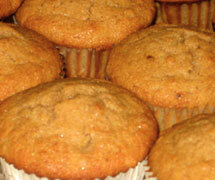 Heads up: without gluten these muffins won’t rise, but are still healthy and delicious.